ERBE measurements of radiative imbalance. The earth’s temperature at any location is never in equilibrium. It changes daily, seasonally and annually. Incoming solar radiation varies enormously especially near the poles which receive more energy per day in summer than the equator. 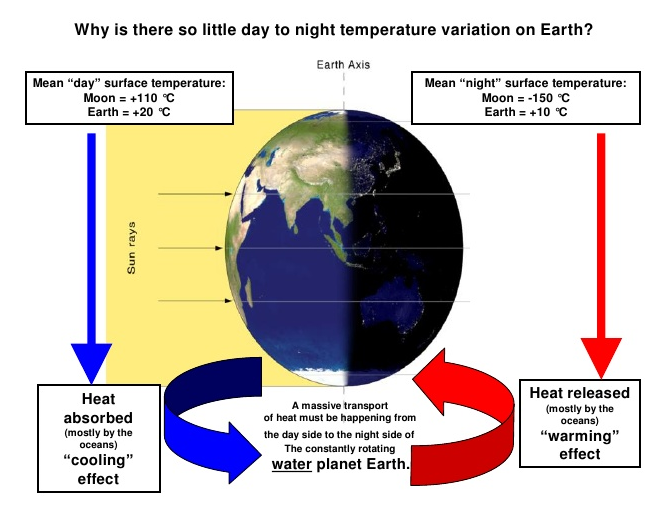 The earth cools primarily by moving heat from hot tropical regions towards high latitudes where net IR radiation loss cools the planet, thus maintaining a certain temperature profile. Rising CO2 levels modify that radiation imbalance profile slightly. Surface temperatures in the tropics are not really warming at all. Any excess heat induces more clouds and more convection while surface temperatures remain constant. What really happens is that the meridional radiation profile changes. Slightly more heat is transported polewards so that hot places are shifting more heat to cold places which are doing the warming. If CO2 levels stop rising then a new temperature and radiation profile would rather quickly be reached. This is then called ‘climate change’ but any such changes are concentrated in colder regions of the world. The global ‘temperature’ itself is not changing, but instead the global distribution of temperature is changing. Temperatures at the poles during 6 months of darkness would fall well below -150C if there was no atmosphere, similar to the moon. Instead heat is constantly being transported from lower latitudes by the atmosphere and ocean and so that temperatures never fall much below -43C. If more heat is transported northwards than previously, then minimum temperatures must rise, and this is what we observe in individual measurements. The main problem with all the existing observational datasets is that they don’t actually measure the global temperature at all. Instead they measure the global average temperature ‘anomaly’. . .The use of anomalies introduces a new bias because they are now dominated by the larger ‘anomalies’ occurring at cold places in high latitudes. The reason for this is obvious, because all extreme seasonal variations in temperature occur in northern continents, with the exception of Antarctica. Increases in anomalies are mainly due to an increase in the minimum winter temperatures, especially near the arctic circle. To take an extreme example here is the monthly temperature data and calculated anomalies for Verkoyhansk in Siberia. Annual temperatures vary from -50C in winter to +20C in summer. That is a seasonal range of 70C each year, and a year to year anomaly variation of ~8C is normal. The only global warming effect evident is a slight increase in the minimum winter temperatures since 1900. That is not due to any localised enhanced greenhouse effect but rather to an enhanced meridional heat transport. Temperatures in equatorial regions meanwhile have only ~4C seasonal variations, and show essentially no warming trend. Long term changes in temperature anomalies occur mainly in northern continents in winter months. This is not because the earth as a whole is warming up but rather that meridional heat transport from the equator to the poles has increased and the largest effect on ‘anomalies occurs in winter. The average absolute temperature of the earth’s surface is unknown. Basing the evidence for climate change on the 150 year trend in global averaged temperature anomalies still biases the result towards higher latitudes where most of the stations are located. When heat is released into the atmosphere from the oceans, it is transported toward the poles to dissipate into space. 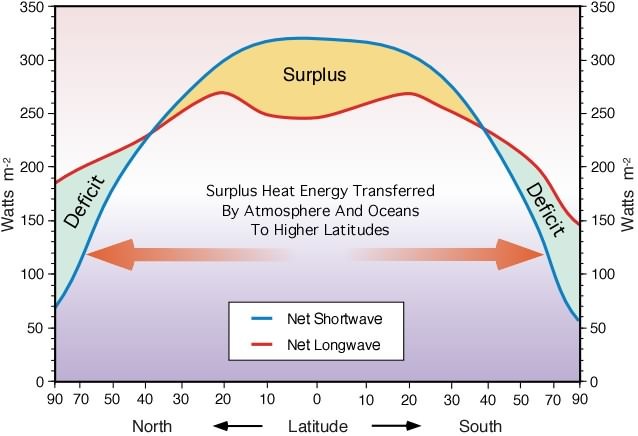 Places in higher latitudes are warmed, not by radiative effects of greenhouse gases in those locales, but by the incursion of warmer air from the equator. What happens if more CO2 is added into the atmosphere? No one knows, but there are many opinions, a popular one being that more heat is retained in the atmosphere. But in that case, that additional heat will be shed by the planet in exactly the same manner: transport to the poles with slightly less extremely cold air at the higher latitudes. Why in the world would we pay anything to prevent a little bit of warming in the world’s coldest places? Are you aware that each of the past three decades has been warmer than the one before, and warmer than all the previous decades since record keeping began in the 1880s? This trend is based on actual temperature measurements. Do you believe that there is uncertainty in this warming trend that has been directly measured? If so, please explain. I am also aware that the discrepancy between land-based temperature stations and satellite temperature stations can be attributed to expansive urbanization within in our country where artificial substances such as asphalt can interfere with the accuracy of land-based temperature stations and that the agencies charged with keeping the data do not accurately account for this type of interference. I am also aware that ‘warmest year ever’ claims from NASA and NOAA are based on minimal temperature differences that fall within the margin of error. Finally, I am aware that temperatures have been changing for millions of years that predate the relatively short modern record keeping efforts that began in 1880. What about the heat in the oceans due to absorption of heat from the air? What you claim is that the heat has already gone to the poles and implicates that the oceans cannot be warmed by the air itself? The dogma that CO2 heats the earth is actually warming of the tropics (troposphere) sending this air to the poles? So CO2 matters, but thru distribution. When writing, the North Pole repeatedly sets new records of warm air pumped up from the tropics. Eystein, there is no mechanism for the air to warm the ocean. LW radiation is absorbed in the first mm and results in evaporation. The latent heat in the air is transported toward the poles and causes the effect of warming in winter at higher latitudes. Thanks for commenting Eystein. I was guessing you were a fellow Dane (my mother was an Henningsen). I will take and use your fine phrase, “the nuances disappear in the global warming dogma.” Says it all really.